We bought this farm more than 40 years ago, when everybody moved from the countryside to the cities. The soil was obviously uncultivated, the house was in ruins and the hay loft was crumbling. Our father planted with great passion 15 hectares of new vineyards, looked after the olive trees and rebuilt the main building with the annexed wine cellar. The old cattle shed was transformed into a large living room with arches and cross vaults made of bricks. The farm continued producing wine and olive oil but the house was used for many years only as a manor house. In 1987 we started thinking about using it as an accommodation for tourists. Our guests can taste all our products, carefully instructed by the masters of the house, Nino and Cesare. They welcome the guests and take care, with discretion, that their holiday leaves nothing to be desired. 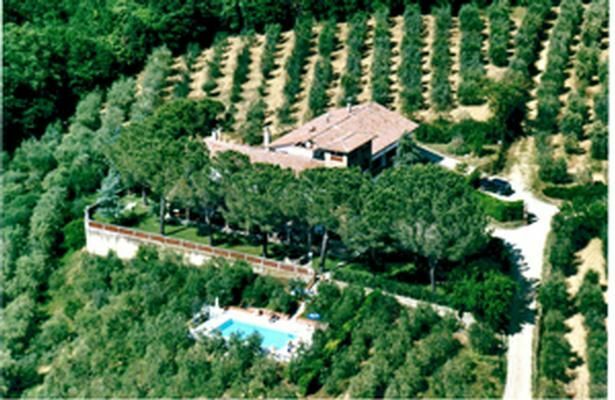 The centre of the farm consists in a large panoramic villa (1401) dominating the Elsa Valley with view of San Gimignano. Large hall of about 150 square metres, with arches and cross vaults, created in what once was a stable. Outside, patio of the same surface area, with tables and chair. Large kitchen, table and chairs outside, in the garden. Toilet on the ground floor large, fenced garden with barbecue. Adjacent, 5x10 metre swimming pool, 6 large bedrooms on the first floor, three of which with double bed and three with 2 single beds. 4 bathrooms with shower or bathtub. The house has a total surface area of 360 sqm. In case of groups of more than 12 people, there are 3 more bedrooms and 2 bathrooms with shower in a separate apartment located in the same building. In this manner it is possible to accommodate 18 people in total. dinner will "place" in the middle of the week with a catering or cook in the structure. - Pet: once per object included in price . - Heating: per object and day according to consumption (Mandatory). Maybe the expression has been used to many times but it&rsquo;s still appropriate: There&rsquo;s no better comparison than calling San Gimignano, the city of hundred towers, the &ldquo;Medieval Manhattan&rdquo;. A kind of fortified village that, to the great joy of the visitors from all over the world, seems to have &ldquo;turned to ice&rdquo; in the 14th century to keep alive the miracle of an urban and architectonical structure that has remained unchanged over the centuries. In the last 25 years luck was on the side of this corner of the Sienese land: By now San Gimignano has surpassed in celebrity many bigger and more important places. It&rsquo;s the home of one of the most famous and antique Tuscan wines, the only white wine which is well known all over the world: the Vernaccia. Certainly it&rsquo;s not enough to mention only the inevitable comparison with Manhattan (by now there are only 18 towers left). The little town and its territory have so much more to offer. The Elsa valley, antique and very civilized land, cradle of the trade routes in this region and cradle of learning and art from the time of the High Middle Ages, rich in famous monuments, beautiful little towns and breathtaking panoramas. Let&rsquo;s mention just some of them: Colle di Val d&rsquo;Elsa, the city of crystal, Casole, Monteriggioni with its intact city walls that have been celebrated even in Dante&rsquo;s Divine Comedy, Poggibonsi and its fortress of Poggio Imperiale, an uncountable number of Romanesque parish churches (like the one of Cellole or the extraordinary Badia a Isola), oratories, monasteries, castles and villages. All these sights are not only relics of a glorious past, but they are still a symbol of the territory&rsquo;s richness which still lasts thanks to the industriousness of its people and a dense network of trades that has its origins in medieval times, when the Via Francigena ran through the Elsa valley, the road which connected the papal town of Rome with Northern Europe between the 9th and the 15th century with a steady stream of warriors, pilgrims, saints and emperors. Today we can still find some traces of this extraordinary road which explain why in the course of the centuries villages, castles, bridges and pilgrims&rsquo; hospitals have been built just where they are and not anywhere else.